Do not change money on the street! Use banks or money exchange offices. Banks are open on workdays usually from 9 a.m. to 5 p.m., opening hours are usually shorter on Friday. Commissions are quite high in banks, they charge 2-3% commission. Exchange offices are open daily, mostly until 6 p.m. 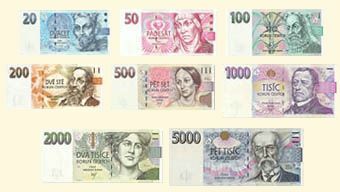 Tourists mostly use the "valuty nákup - we buy" exchange rate. The billboards "0% commission" usually refer to the "valuty prodej - we sell" exchange rate. Some of exchange offices charge extremely high commission. Prior to exchanging money, please check the final amount of money with the clerk at the counter. We recommend you a list of exchange offices, which offer the best exchange rates according to the latest information on the market without commissions. Other exchange offices: Chequepoint, Exchange s.r.o., Prodejvalut.cz.